When you have pork, do you prefer it with sweet ingredients (like chutneys, fruit, sweet glazes) or do you like savory flavors (spicy, salty, earthy)? I love savory pork dishes and always get excited when I see a menu that has a pork dish without some sort of fruit. The best one I ever had was at Emeril's No 9 Restaurant in Vegas - it was a spicy pork loin with a chocolate-less mole sauce. I still need to figure out how to recreate that some day! When I cook pork at home I often choose Asian ingredients to enhance it. 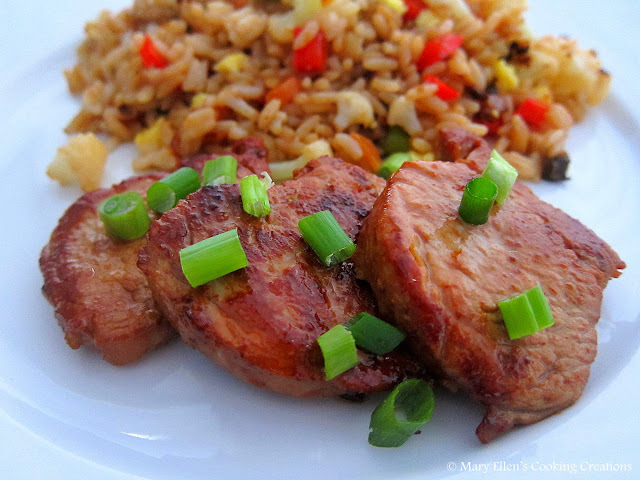 When I saw this recipe for Korean Pork Medallions on The Way the Cookie Crumbles, I immediately bookmarked it. Slicing and pan searing pork tenderloin is such an easy way to cook it - the cooking time is so short that you can have a great dinner on the table in no time, and the meat stays so amazingly tender. Trim the pork of any silverskin and excess fat, and cut on the diagonal into ½-inch-thick medallions. In a small measuring cup, whisk together the soy sauce, rice vinegar, brown sugar, garlic, ginger, sesame oil, and Sriracha. Toss ½ of this mixture with the pork medallions in a large bowl; reserve the remaining mixture to use as a sauce. Let the pork sit at room temperature for 25 minutes or refrigerate for up to 2 hours. Heat 1 tablespoon of the canola oil in a 12-inch, heavy-based skillet over medium-high heat until shimmering hot. Remove the pork from the marinade, shaking off the excess, and transfer the pork to a clean plate. Discard the marinade. Add half of the pork medallions to the skillet, spacing them evenly. Cook them without touching until well browned, about 2 minutes. Flip and cook until the pork is just cooked through (slice into a piece to check or use a meat thermometer), about 2 more minutes. Remove pork from the pan and pour out the oil and wipe the pan with paper towels (if the drippings on the bottom of the pan look like they may burn, wash the pan). Return the pan to medium-high heat. Add the remaining 1 tablespoon canola oil, and cook the remaining medallions in the same manner. Pour the reserved soy-ginger sauce over the medallions. Serve immediately, sprinkled with the remaining scallions. I served the pork with Vegetable Fried Rice. I used carrots, red peppers, and tiny cauliflower florets and loved it! I love pork. Either sweet or savory, I'm a fan. I do love Asian style savory recipes though, sometimes it's a blend of both salty and sweet - and is just perfect for pork. I am totally with you on that savory preference! People are crazy about putting fruit in their pork dishes. I'm glad you liked this as much as I did!